I am a member of the Collective Bias Social Fabric Community. This shop has been compensated as part of a social shopper amplication for #CollectiveBias and its advertiser. A day shopping is my favourite way to spend some “me time”. We spend days in shopping malls as a family but I relish opportunities to go alone. On weekdays it’s nothing like scary Saturdays. As an only child, I am at ease with my own company. The peace of not having a small person rabbit “can we go to the Apple Store next mummy,” is welcome. So 2-3 times a year, I’ll leave the husband and child at home and visit some shops. I’m back at Westfield Stratford City (well it is only 15 minutes from Walthamstow) and occupied myself for the afternoon in Marks and Spencer! Westfield Stratford City is by far my favourite branch of M&S. Four spacious airy floors and you can park right outside (Car Park B but make sure you’re at the M&S end). There are 3 cafes but my favourite is the “Tasting Cafe” with funky furniture and picture windows overlooking East London. Close to the tube, it’s a handy place to meet people. It feels very civilised. Not manic like Starbucks or Costa plus the hot drinks come with a free biscuit. Lunch: in the interests of “research” this is the seafood tasting platter. They do a similar ploughmans one with cheese, pickle and onions. 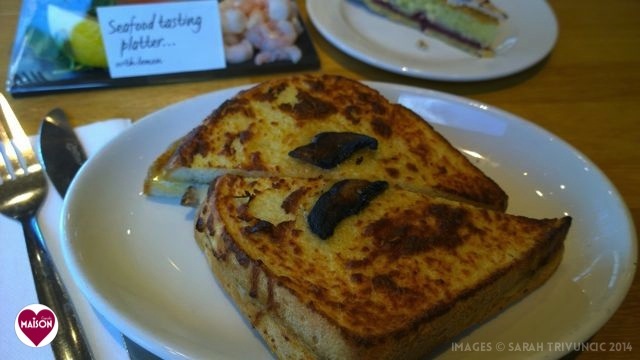 Cheese and portobello mushroom toastie. You buy it prepacked at the till then they bring it to your table. It appeared seconds after I’d sat down. After lunch I use the free M&S wifi. More reliable than others in the centre and strong enough for video calls. Sometimes I work but today I’m chatting to friends on Facebook. 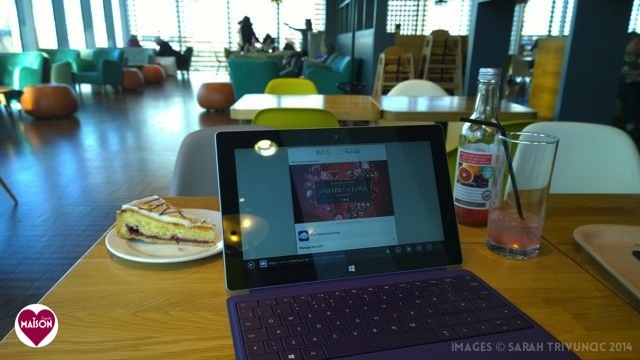 (That natty little purple gadget is my Microsoft Surface tablet to be featured in its own post soon). And yes that is Bakewell slice. With a slurp of sparkling cranberry and blood orange juice. After lunch I nose at the homewares. I really liked the copper pans hanging up above. We’re researching new sofas and chairs. 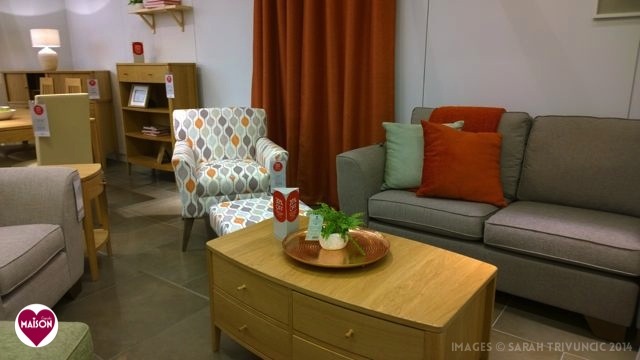 I love this Orla Kiely influenced print armchair and stool. 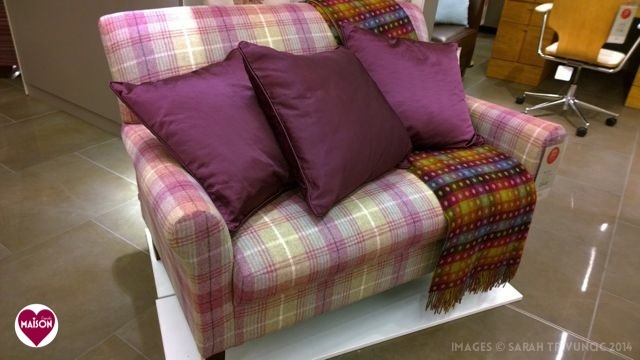 We especially want a compact “love seat” sofa for our bay window. M&S has a big range of fabrics to order a version that suits your decor. Working my way downstairs I spy this red dress. Out of the habit of buying new clothes, it’s fun to imagine an updated capsule wardrobe. 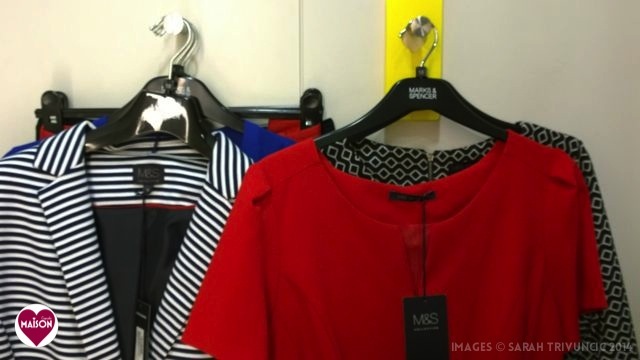 M&S fitting room ladies are always plentiful and attentive. I used to work for one of Next’s Oxford Street stores in the 90s and am often disappointed by today’s customer service standards in retail. The fitting room is roomy with a heavy curtain actually fitting the cubicle. There are 3 mirrors at different angles, plenty of hooks, a stool and a shelf. Now let me say this my first ever foray into blogging fashion items. I was in fact once a fashion student but that’s another story. I bought cobalt blue blouse and black trousers but may return for leopard shoes! And don’t you dig the Sindy stool in the fitting room? These shoes were hard to leave behind. I can still hear them calling me. Downstairs in the food hall they also sell greetings cards. 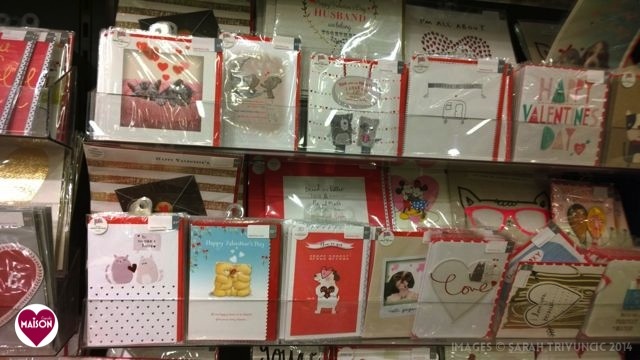 I mostly buy my greetings cards in Marks and Spencer, they’re excellent quality and value. The Valentine’s card for my husband features Kevin and Amanda style Boston terriers. My favourite section is the imported foods section. 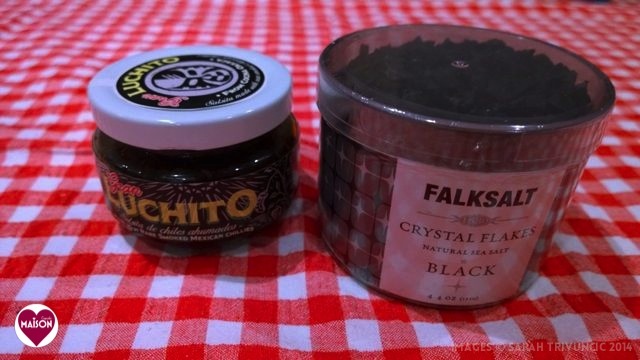 Here I picked out Swedish black salt (imagine this on bread rolls or pretzels). They also do Gran Luchito as seen in my brownies. 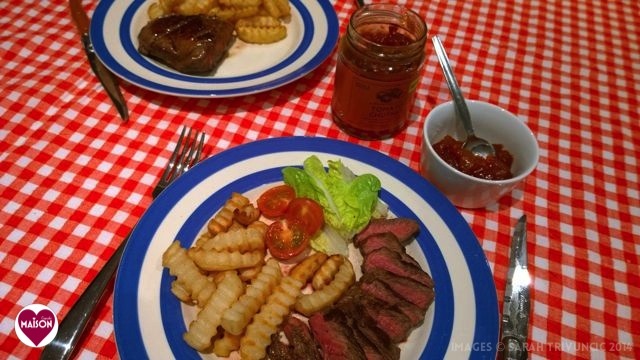 Pre-Valentine’s supper; flat iron steak with peppercorn sauce, crinkle cut oven chips and tomato chutney (rather than ketchup). Chips are a rarity in our house so these were a real treat. I should mention my love of M&S labelling. 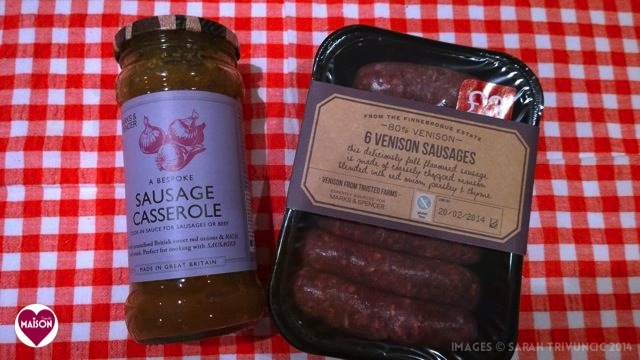 These sausage sauce labels are like the font for “Canteen” restaurant chain selling British food. 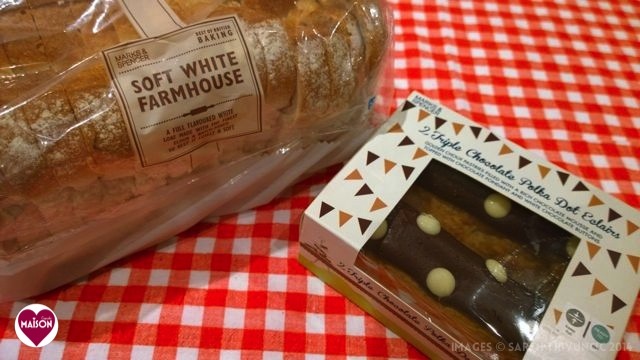 Baked goods labelling influenced by Great British Bake Off – a rolling pin icon on the bread bag, the bunting on eclairs. 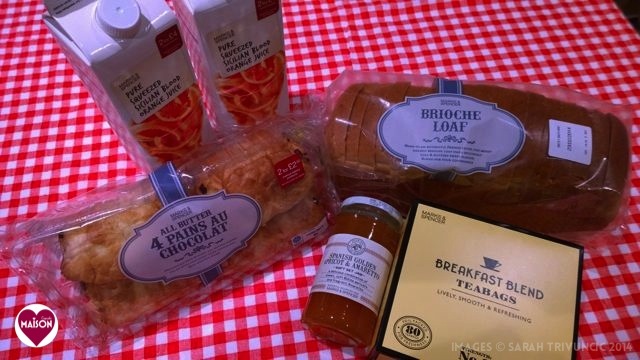 Valentine’s breakfast; There’s French style branding on the brioche and pastries as well as the 1930s style teabags. Ta-dah, dinner served inside 20 minutes. I can’t believe these two steaks only cost £5. 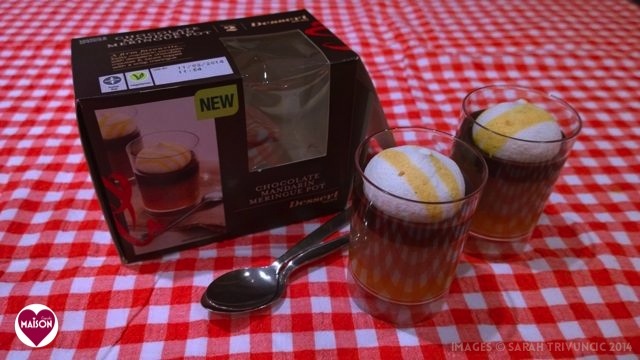 Finally it’s dessert – chocolate puddings with orange compote and meringue topping. In prop-tastic plastic pots that I’m going to keep and use again in another post! 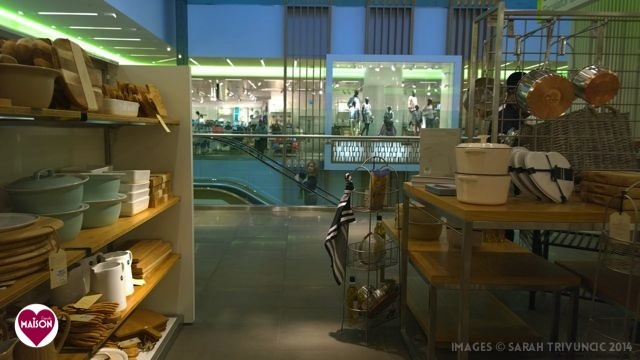 What’s your favourite thing about Marks and Spencer? Post commissioned by Collective Bias for a fee. Sarah, the outfit really suits you, the blue top especially and I do think you have to return to buy those shoes! I have always loved M&S mainly because I can buy trousers that fit me in length. I need them short as I am not exactly tall! Thanks Laura! Same here, I’m only 5 ft 2 and M&S is one of the few places I can buy shorter length trousers in my size. 🙂 I was aiming for French chic, nice to hear I conveyed that! The homeware section is huge, I love especially their bed linen and ceramics. They change the ranges very frequently in the manner of somewhere like Sainsburys but the quality is far higher. They also did a furniture range by Terence Conran recently that was very Habitat-y and funky. tee hee, well done you for being a fashion blogger and even doing the selfies! I’m amazed at how well luchito has done…M&S no less!!! Ha ha, I never thought of them as selfies as I so rarely instagram myself but yes that’s what they are!!! Hehe, go girl!!!! I’ll have those armchairs! At the very least I’m tempted to have some cushions in that fabric. Or blinds. Whole place needs doing really!! Lucky you having a day out to yourself eating, shopping and browsing. Fabulous. 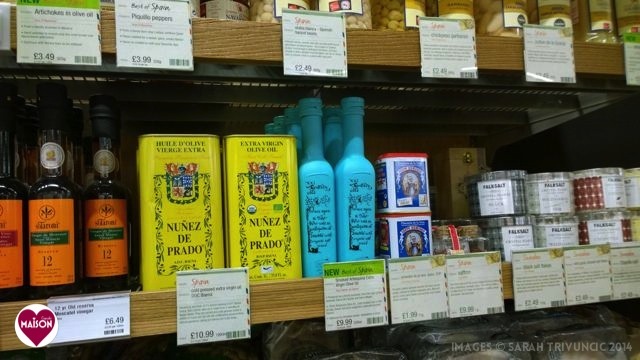 Gran Luchito are now in M&S, well done them. Love the shoes btw. Go back! Great post. Is there anywhere in Westfield you haven’t tried? He he, well I’ve never stepped foot in Forever 21 because I assume I’m too old for it, and I’ve barely plumbed the depths of Primark. Restaurants still on my visit list are: Jamie’s Italian, Busaba Eathai, Bumpkin, Searcy’s, The Cow, Las Iguanas, the forthcoming Ping Pong and Caffe Concerto. Do you think I can get a blogger’s visit to the casino?! I like the beret, think you should do modelling more often. Even if I never do the fashion bit again, I will defintely go back for a toastie! Thanks – I should be more adventurous and not just wear black! Horray for foraying into earlier untested waters espp Fashion – why not I say ! Loved those leopard print pumps! I cant scroll through the remaining pictures in the slideshow! boohoo. I am a big fab of M&S foodhalls and their packaging is spectacular too! Sorry you can’t access slideshow, I thought I had all the bugs ironed out but will investigate. Sounds like a fun day. I too like to go shopping on my own. It’s just so much nicer not having to negotiate where to go next etc. Hope you had a wonderful time! Love the blue top especially. 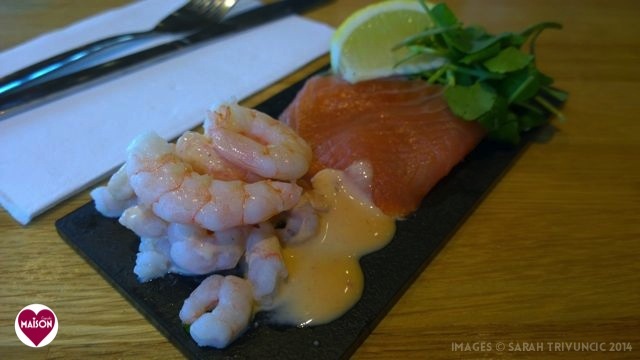 My fav thing about M&S is the food – I love it. Fantastic quality and reasonable prices. 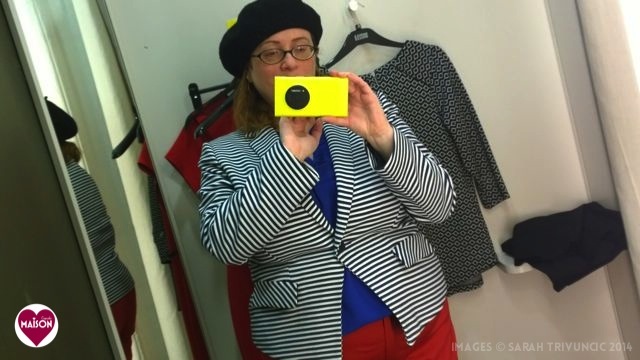 In the stripes jacket outfit you look like an actress taken out from french romance – fabulous! WOW looks like a fun day eating and shopping and trying new clothes. What a lovely day out. i must come to Westfield with you again for the day. 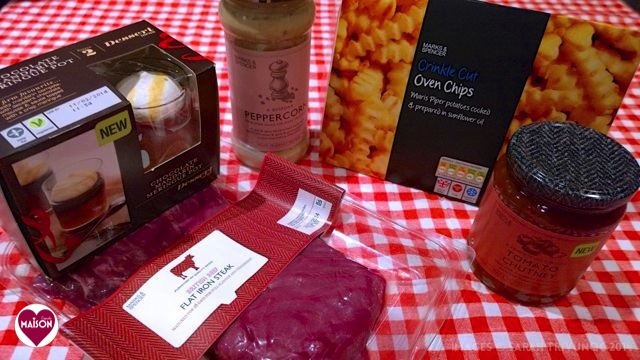 I do love M&S food, it has improved immeasurably since they started selling branded goods too. What a fabulous day out. What a great day out, the food was, of course, the highlight. But I have to say you looked great in that cobalt blue top. I love M&S in Westfield. 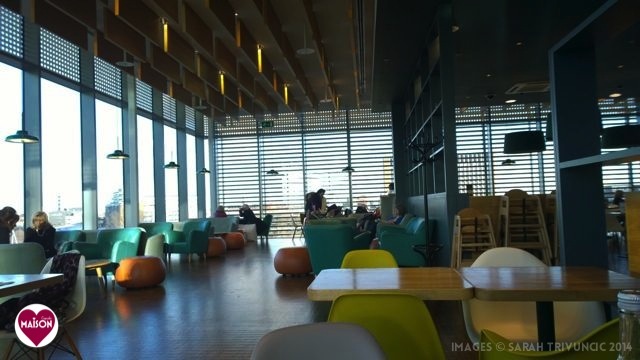 There cafe is a quiet safe haven away from the hustle and bustle of the busy crowds. We should def meet up there one weekday for lunch. Loving your fashion shots, the outfits look very good on you. I know have my eye on the cobalt blue shirt. My favourite colour. Very sorry for my appalling grammar! I mean Their and not There; and now and not know! Hangs head in shame. Wow, great post! 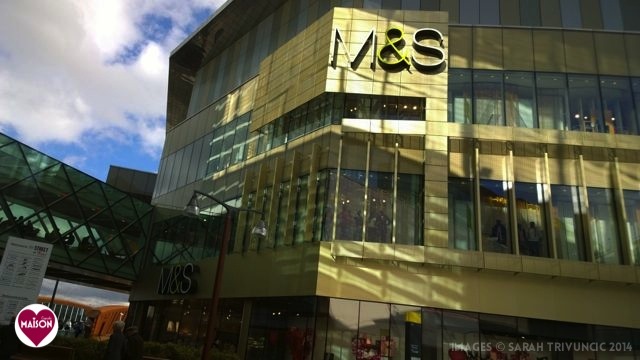 I’m an English girl living in California for the last two years and I miss M&S so much!